The Kalo Foundation of ParkRidge was established in 2006. It is a nonprofit organization dedicated to preserving the rich artistic legacy of the city through education, advocacy, and preservation, as well as promoting the arts & crafts as an integral part of our modern lives. Based on the ideals of the American Arts and Crafts Movement, the Foundation will sponsor educational seminars, exhibits, tours, publications and special events to increase awareness and appreciation of the arts and crafts. 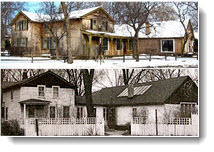 An early goal was to acquire the Kalo House, the Park Ridge home of the Kalo Arts Crafts Community (early 20th century). That effort was not fruitful. However, the former home/workshop of sculptor/artist Alfonso Iannelli became available. Kalo's fundraising drive received dramatic support from the community allowing The Kalo Foundation to acquire the property in 2011. The city was home to many famous artists who helped define innovation and entrepreneurship in the arts, including Clara Barck Welles of the Kalo Shop, Albert and Dulah Evans Krehbiel of the Ridge Crafts, Alfonso Iannelli of Iannelli Studios, and many others. 2008, Albert Krehbiel was named the Illinois State Historical Artist for the murals that he painted on the walls of the Illinois Supreme Court Building. He produced the prototype for these in his studio on Center Street in Park Ridge. Alfonso Iannelli, best known for his sculptural sprites in Frank Lloyd Wright’s Midway Gardens project, was an instrumental force in bringing about the modernist design movement in Chicago. Towards appreciation and education of the arts history of Park Ridge, The Kalo Foundation has put on multiple silver exhibitions, as well as hosting an exhibit of works of Alfonso Iannelli and both Albert and Dulah Krehbiel (April, 2007 exhibit.) In addition to those events the Kalo Foundation puts on events and continues to do presentations to not only the general public, but also in local schools. We're also in the process of updating the historical portion of this website in order to give you greater knowledge and appreciation of the history of the arts in Park Ridge. This is a time consuming task, so we ask your patience in this. Do check back from time to time to see our progress.